Securicall provides industry leading SIA ACS manned security and security guard services throughout South Wales and the rest of the UK. Quality is at the heart of everything we do. Our team of highly trained and committed security personnel are licensed under strict SIA regulations ensuring our clients enjoy the highest possible quality security guard services. Our security guards and security staff are carefully selected, screened and inducted to ensure the security of your own staff, assets and premises along with the highest standards of behavior and performance. Securicall UK Ltd holds SIA approved contractor status for the provision of Security Guarding and Keyholding services. 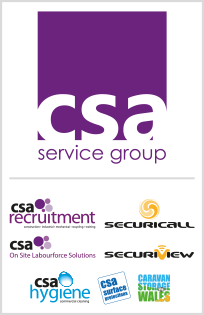 Securicall is part of the CSA Service Group and was established in 1994. The organization provides a high quality security service to both industry and commerce comprising of manned guarding linked with cutting edge surveillance and detection equipment. Through sustainable long term growth, investment and client satisfaction Securicall has become the supplier of choice for security related services to many major Public and Private Sector clients throughout South Wales. Our prestigious portfolio of clients includes Local Government Offices, NHS Hospitals, Construction PLCs, Major Car Dealer Groups and high profile Property Management Agents. Our success has been built on the foundation of working in partnership with our clients, attentive to their commercial needs, Securicall has striven to develop and maintain exemplary long term levels of customer service to its’ clients. We have for example forged a longstanding relationship with CEM Day Group that is nearly a decade old. This sense of partnership is an inherent feature central to Securicall’s culture and philosophy. What makes Securicall different (if not unique) is that we take these principles and use them as real, identifiable and measurable critical success factors. As goals and objectives are met, new strategic plans are made to drive our progress along a permanent pathway of improvement.